NOTES: Can be built without paint or glue. Ah, the Gundam Universe: so many story arcs, so many alternate realities and so many robots in primary colors. How do the fanboys keep it all straight? Fortunately for us, we can pass almost all of that by because the original video animation this mobile suit kit is from is the only one in the Gundam Universe that takes place in the contemporary world. Be grateful for that. In short, the story is this: The OVA is called Gunpla Builders Beginning G and in it Japanese teens are able to buy a Gunpla model of their favorite Gundam mobile suit, build it stock or custom, and then bring it to a local Gunpla Battle virtual reality arcade. The model is scanned into the system and the Japanese teen can put on his (or her) virtual reality gear and control the mobile suit in a virtual battle arena, fighting in teams or solo. Gunpla is one of those awful-sounding contracted loan words that too many Japanese anime use in an effort to be kewl ; in this case it means a GUNdam PLAstic model kit. 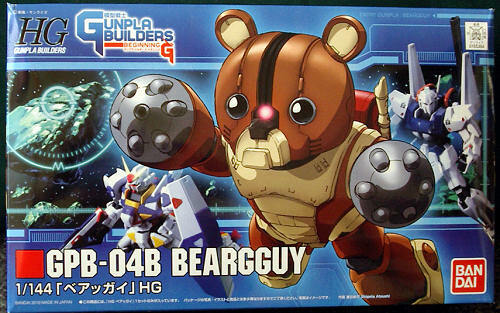 The Japanese teens in the OVA who buy these kits are called Gunpla Builders, hence the series title. This silly robot teddy bear, who on virtual 1/1 scale is sixty feet tall, is know as GPB-04B BEARGGUY and is driven by Gunpla Meister Rina Noyama, a somewhat ditzy high school girl. It is a variation of amphibious mobile suit MSM-04 ACGUY from the anime series Mobile Suit Gundam. Along with its innocent teddy bear looks, it sports a red schoolgirl s backpack with an attached recorder. This teddy bear, however, packs quite a punch: there are 4 anti-missile 105mm Vulcan guns mounted in the ears, a mega particle gun in its right forearm and two more in its eyes, six-shot missile launchers in both hands with another six-shot launcher in the cute red backpack. The recorder is actually a Beam Saber. The right arm extends and can be mounted with optional claws to strike down other mobile suits. There is a pair of small thrusters mounted on the bottom of the backpack, which BEARGGUY uses to maneuver in space. The shiny pink dot above his nose is never explained. Jeez, do you realize people live and breathe this stuff? Bandai is known for high quality moldings of not-so-ordinary subjects and this kit is no exception. There are seven sprues in four polybags, with one sprue in multi-colors and one sprue of poly-caps. 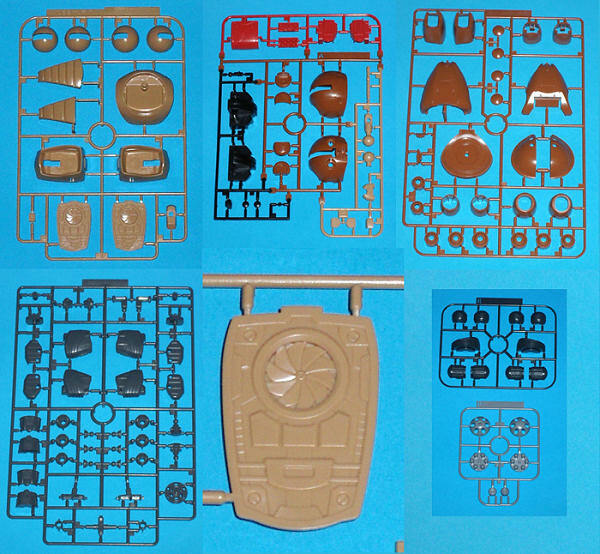 The other sprues are molded in various teddy bear colors; brown, tan, black and grey. The kit is fully articulated and can be set in a variety of action poses, though a set of claws is not included in the kit. Some anime-style eye stickers are included but the choices are pretty weak. The plastic is fairly thick, but the only molding glitch I could find was some surface swirling on the backpack. Bandai says this kit can be built with no paint or glue so the surface of the parts is pretty glossy. This is not a snap-tight kit, but more of a press-together. The sprue gates are quite small so as not to mar the gloss surface when cut. The parts are quite well done and look like they will fit together with no problems. The kit engineering is cleverly designed to hide any seam lines. Even though the now obligatory federal CYA warning says the kit is for 15 year-olds and up, it could easily be completed in an afternoon by a much younger child. The instructions are in Japanese but they are done in exploded view and are easy to follow. The instruction booklet is an eight page affair, with one side in four-color showing BEARGGUY in anime action, details of the kit, some example poses, a sales pitch for accessories and a bio of Rina Noyama. The kit is made of ABS plastic so hot glue will be required if the builder wants to improve the kit. A paint color key is given, but it is only in Japanese; an English translation is available on several Gundam bulletin boards. Even though the kit is designed to be painted as a teddy bear, I have seen two other painting options: a polar bear and a panda. The panda option looks pretty spiff and adds another layer of goofiness to the whole thing. In researching this kit I read that Bandai will soon be coming out with some Gundam kits that will be paint, glue and tool free. The sprue gates are designed to snap when twisted and they say it will not mar the finish. I think this is a great idea and can see it really encouraging kids to start in modeling. The fact that these kits are meant to be played with and abused directly after completion should also be a huge attraction for young modelers. Bandai has again produced a sturdy, high-quality kit that builds quickly and without the fuss of using paint or glue. Believe it or not, Bandai is marketing this to the Japanese tween girl crowd, though it should attract the Gundam fanboys and people who appreciate incredibly silly robots as well. Besides, where else can you get a kit of a sixty-foot armored teddy bear armed to the teeth and ready for some massive retaliation? Recommended on the laugh factor alone. Postscript: When I was looking up the list price and kit number to finish this article, I noticed that while BEARGGUY has just hit the US stores, the first run is already sold out at HobbyLink Japan. Review kit courtesy of my twisted sense of humor.